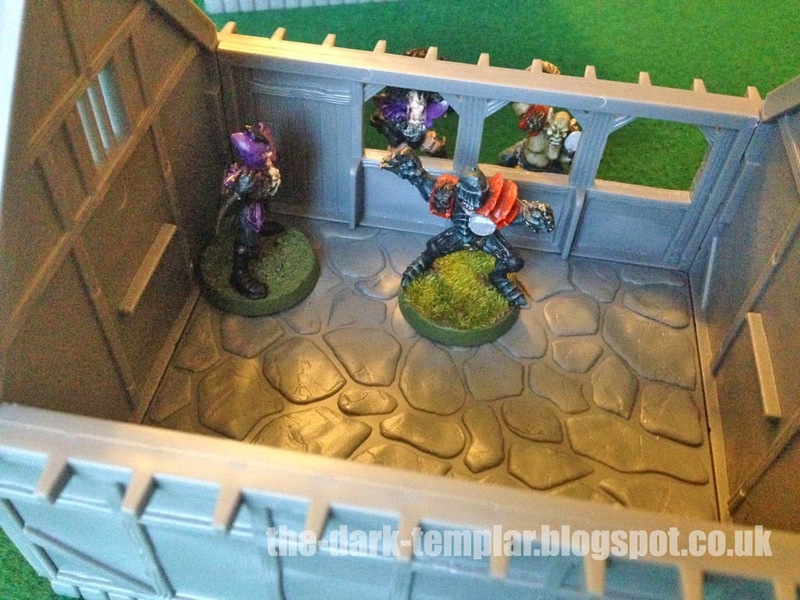 So here we are with my final look at Tabletop Workshop's Monastic Scenery set. 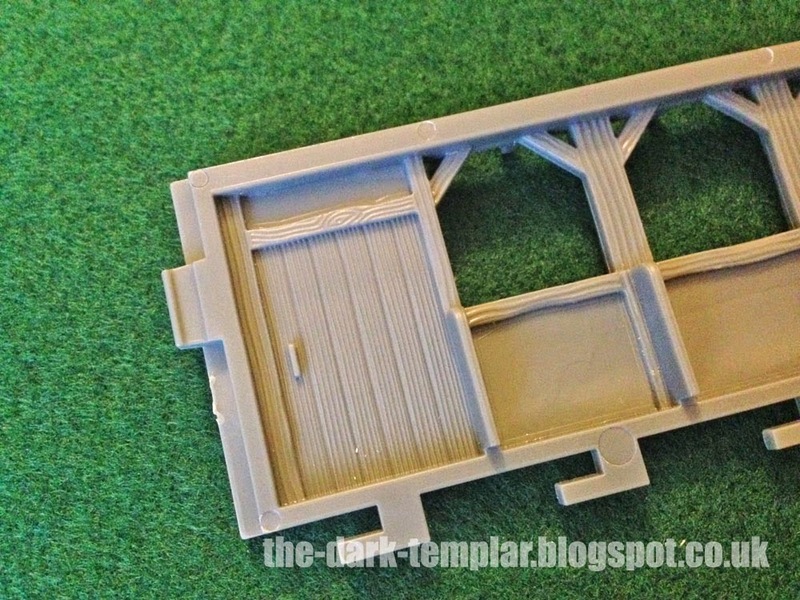 You can find part one here – Chapel – and part two here – Cottage, Barn and Stable. 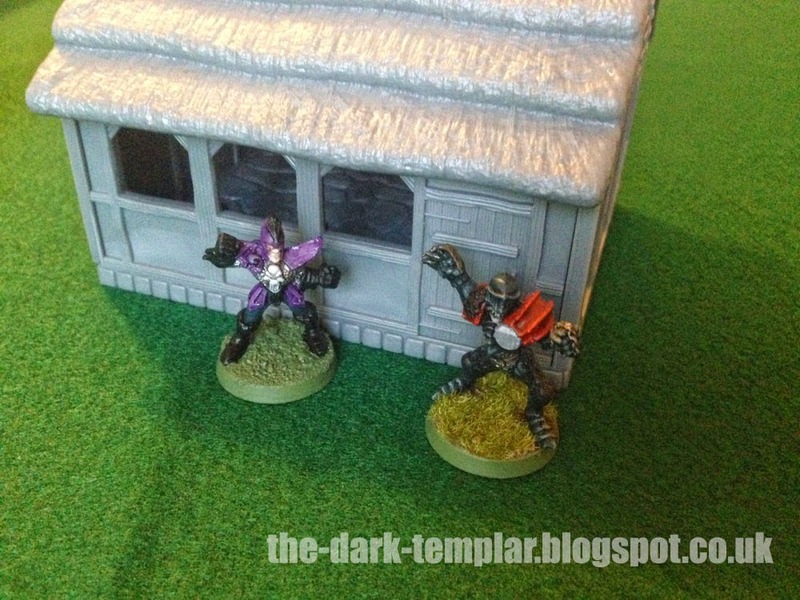 Today I have photos of GW miniatures alongside the buildings, to give you lovely folks an idea of how they compare in scale. As you can see from the images, there's not a lot in it – certainly nothing to cause concern or that looks just silly. Externally, I think the fact that the base of the building is a similar depth to the miniatures base helps the scale difference. The doors are a little on the skinny side, but not a lot. It's all looking shiny from this side! On the inside of the chapel, it all looks good. The height of the door means that models would theoretically have to lower their heads to pass through, but it doesn't look out of place. 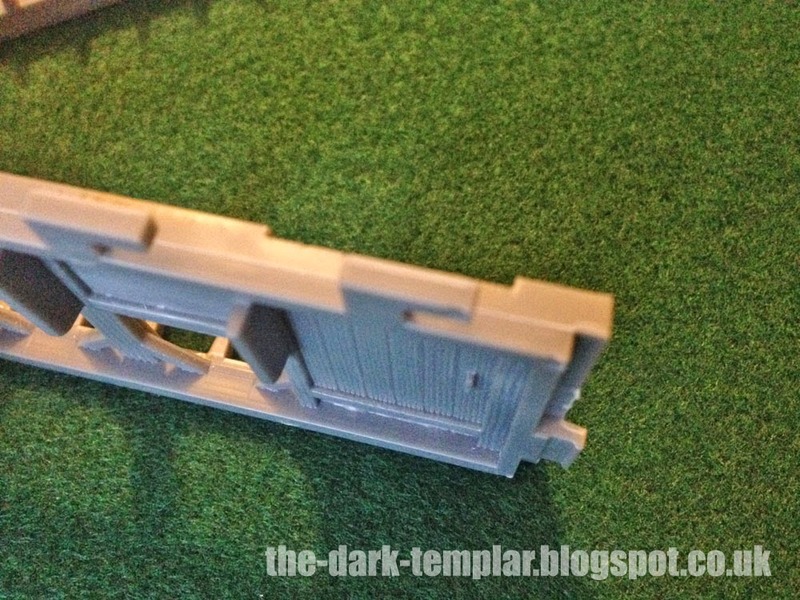 Similarly, the stable door is looking on the small side now that the miniature base goes against the scale difference, but not enough to cause concern. The window height of the stalls is pretty perfect. I have to say that the difference is rather negligible – certainly a lot less than I thought it would be. 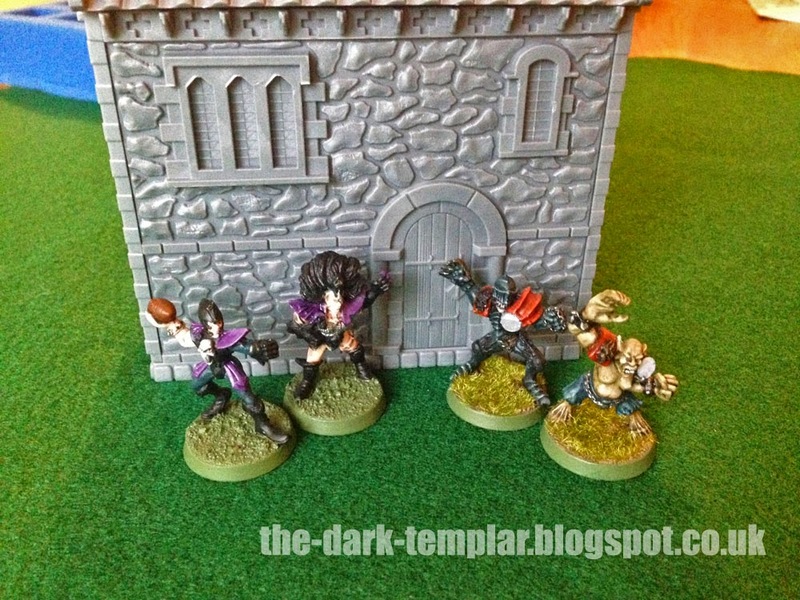 I didn't have any other miniature ranges to compare but I think you can get an idea from these GW models. The other query I had was the possibility of removing doors so that they could be opened/closed rather than a static part of the wall section. Looking at these close-up images of the stable door I have to say that I think it's a 50:50 project. I think for both this and the chapel, it would be possible to remove the door section, though you would destroy the door in the process. In the case of the stable, I think removing the door would compromise the strength of the wall section as the door frame is quite thin. This could be negated somewhat by ensuring the wall section was glued permanently in place. The wall sections are quite thick, so it will take some effort to remove the door if that's the goal. I also have to point out that I said in the last review that the walls were very smooth. I have since noticed that there is texture on these wall sections, albeit subtle (you can just make it out on some of the stable images above). It is enough for a colour wash to pick up on though, so you would get tone variation in these sections. These kits are bloody awesome, even more so when bought in bundles as you get massive savings. 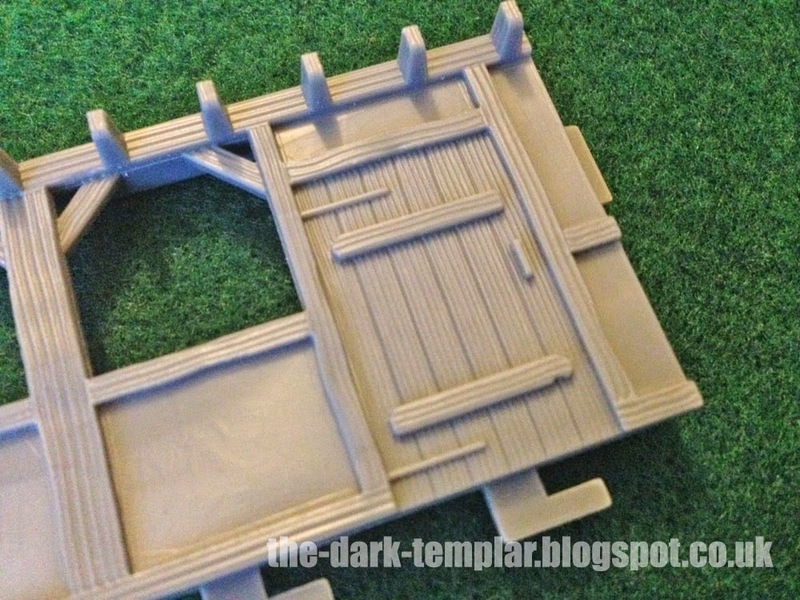 If you're looking for an alternative (or significant improvement) to MDF or resin for your scenery you will not get better than this – the only thing better is bespoke-made terrain which takes hours and/or costs a fortune. The only thing comparable to this is the GW plastic terrain, which whilst excellent is extortionate in price and drowning in skulls. This stuff has turned my head and I'm very excited to see what Tabletop Workshop capable of in the future. Stop faffing and go buy some already…you know you want to!! Thanks that a great review. 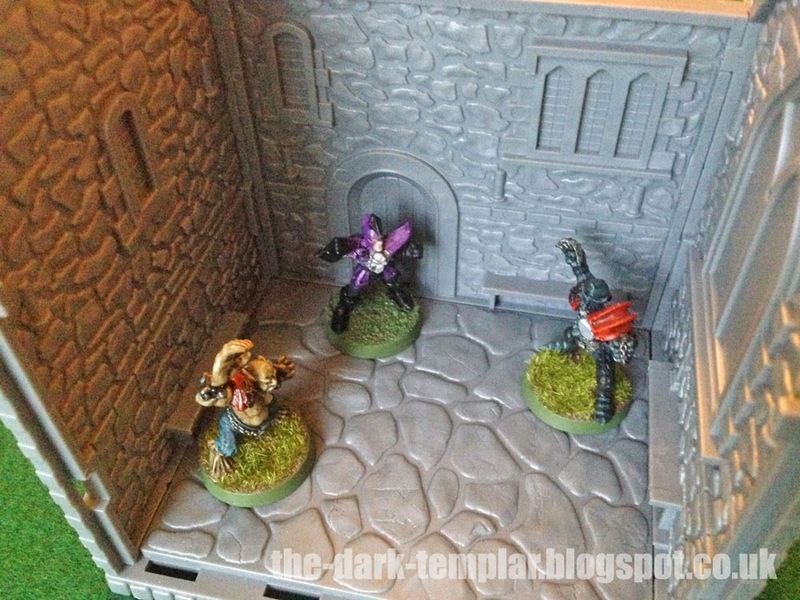 I'm definitely thinking of using some of the ruined and whole to allow me to fill out my mordheim terrain without needing weeks of work. I reckon glued together it might be worth removing the doors and compared to the work other products need to get them up to scratch still save a bucket of time even if you need to knock up a replacement door from Balsa. You could be right regarding the door. If you took a dremel to it you could have the door off pretty quick, just a case then of making a replacement. Thank you so much for reviewing these fine products.